Coverage: Worldwide. Siobh�n Craven-Robins is one of the UK's top wedding co-ordinators who regularly appears on TV and in the press giving wedding advice and organising celebrity weddings. 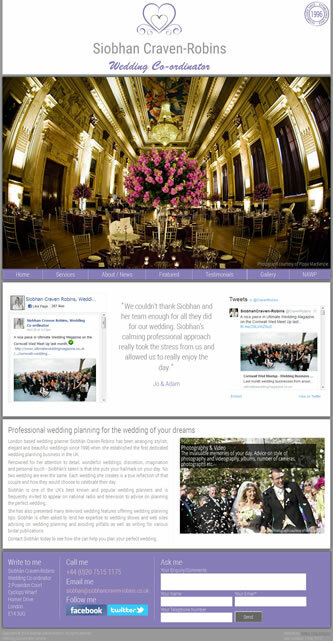 Specification: Siobh�n wanted a clean, simple and professional website which reflected her style of wedding planning and was in keeping with the 'wedding' theme. The website was completely redesigned/built in June 2016 to give a simpler look and link in her Facebook and Twitter feeds. "Excellent service. Quick response and interpreted my ideas well. Creative input was excellent and also answered any queries or concerns I had promptly explaining in jargon free language that I could understand! I have used Sleepy Frog for some years and will continue to do so. I also have recommended Carol and feel confident doing so."